Violin Insurance : How To Buy? Buying violin insurance is a good way to ensure that your violin is well-insured and covered in uncertain circumstances, like damages or theft. It is one way to give additional care and protection to your violin. The purpose of a violin insurance, is to compensate the owner for specified loss, damage and other unforeseen circumstances (differ by companies), and in return for payment of a premium by the violin owner. Why Should You Buy Violin Insurance? First, you get to be covered the loss or damage of your precious violin. Most violin which are insured, are violins which are highly priced, usually in the six or seven-figures range. Most violinists also buy insurance to provide coverage for the antique violins they borrow from famous violinists, or museums. Similarly, these violins come at high values, and the insurance will cover costs of damage or loss, if the violinist damages or loses it. Yes. It gives you, the violin owner, a sense of security. How To Buy Violin Insurance? Just like buying an expensive violin, you have to know what to look out for when you buy violin insurance. Here is a guide to show you how to buy violin insurance, and the 3 important factors before you make your decision. While most violinists buy violin insurance to cover their more expensive violins, there are some who buy to cover violins which are lower priced too. However, you have to check if your violin is worth insuring. The premiums you pay for your violin, is determined by the insured value of your violin. If you want to get your violin insured at higher value, you have to pay higher premiums. If you think your violin is worth insuring, one that is rare and can fetch high prices in open market, then paying a higher premium for a higher coverage will be wise. If not, you might want to consider again. 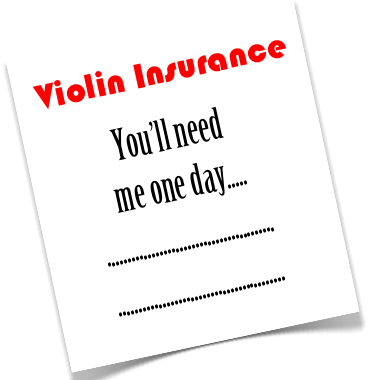 You would want a trusted and experienced insurance broker to help you get your violin insured. He must be able to explain all terms and conditions stated in the insurance contract. You can find them via your violin teachers or concert violinists who have bought violin insurance before. Likewise, you can find them through big insurance companies whose main business in life and general insurance, but also provide insurance in musical instruments. The last thing you want to have, is that you’re not able to contact your insurance broker when you need a claim. There are many things that insurance can cover for your violin – fire, flood, theft, loss, accident…etc. But do check exactly the situation they cover. Different situations may present different coverage. If possible, get the broker to define each situation to you. A term can be interpreted differently by different violin insurance brokers. The term ‘All-risk‘ means coverage of major risks like fire, theft, accidents. However, there might be special situations which you are unsure if the insurance does covers, even though it’s written ‘all-risk’. Hence, do ask, even if multiple times, if you’re unsure. Where To Buy Violin Insurance? If you know of any violinists who have bought violin insurance before, and they experienced good service with the insurance broker, do consider getting one from them too. Otherwise, you can also buy violin insurance online, but via authorized and reputable companies only. With reputable and trusted violin insurance brokers, you can feel more assured that you can contact them when you need them. While you can get your insurance online, it is still wise to get in touch with their representative, by phone or face-to-face, to help you complete the purchase. You also need to negotiate the violin insurance quote, the premiums paid, and any special conditions for your insurance. Do not shop for insurance on impulse, or get enticed with discounts on premiums. Going further steps to buy the right violin insurance that covers your expensive violin well is time well spent. You’ll be thankful when the need of the insurance comes. Questions about violin insurance? Leave them below!